Bill O’Reilly is a purveyor of sexual violence who has consistently used his platform to promote hateful and divisive rhetoric that attacks women, Black culture, and civil rights. Most recently, on the heels of O’Reilly’s racist and insensitive remark about Representative Maxine Waters’ hair and subsequent invocation of anti-black tropes, it was revealed that Bill O’Reilly and Fox news have paid out more than $13 million dollars in sexual harassment settlements to five women. O’Reilly has used his position of power on the network to prey on vulnerable women and attempt to force himself sexually on them--harassing subordinates with disgusting phone calls and threatening to fire them for not giving in to his lewd and misogynistic advances. Enough is enough. 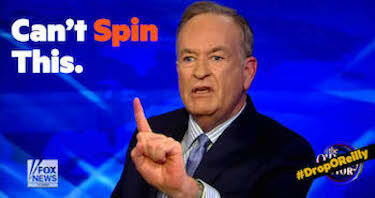 Tell "The O'Reilly Factor" advertisers to #DropOReilly now! I'm asking you to #DropOReilly and stop advertising on his show now. Bill O'Reilly is a purveyor of sexual violence who has had to pay out over $13 million dollars to quell charges of sexual harassment. Furthermore, he has consistently used his platform to promote hateful and divisive rhetoric that attacks women, Black culture, and civil rights. It is in the best interest of your company to #DropOReilly now.